...now available in our Etsy shop! These will be in the shop the entire month of July as part of Christmas in July! They are improved from last year. The biggest complaint from our customers last year was the glitter strips did not have adhesive on the back...so we have replaced the glitter strips with washi tape! YES WASHI TAPE...I love the way these look...cute and trendy! Here are a few pictures...enjoy! Kits are perfect for kids at all ages. Great for sons, daughters, grandchildren, nieces or nephews. 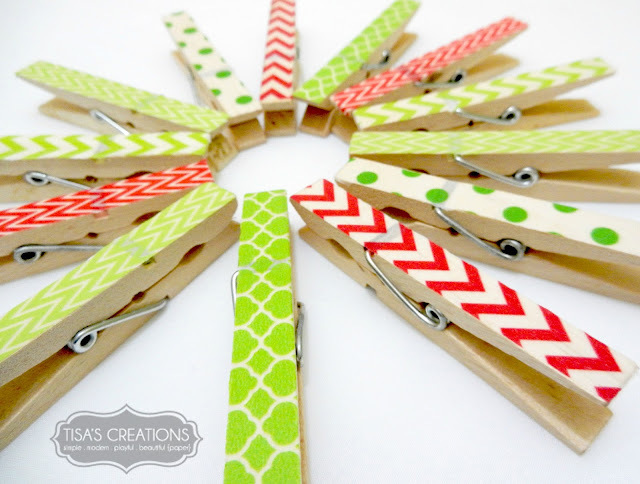 Super simple to assemble, add washi tape each clothespin, add the sticker to each bag and hang – so easy. What a fun project for the entire family! Grab one for every child you know – they will love this! Treat bags can hold candy, small toys, gift cards or special notes.